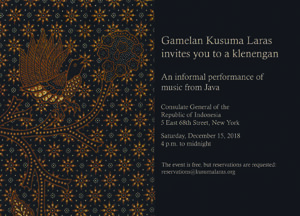 This December, Gamelan Kusuma Laras will present an informal musical event, klenengan, where musicians play throughout the night with the audience coming and going. This event is free and open to all. The klenengan will take place at the Consulate General of the Republic of Indonesia on Saturday, December 15, 2018 from 4 p.m. until midnight. Doors open at 3:30 p.m.
Feel free to bring a pillow or mat to sit on. Though rsvps are not required, we encourage you to let us know if you are planning to attend. Seating is open. Seats can not be reserved. 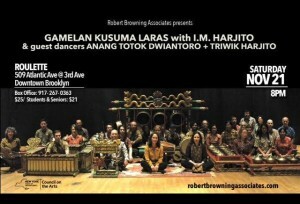 This November, Gamelan Kusuma Laras is performing with the Keraton of Yogyakarta to bring to New York a rare performance of two classical Javanese dances that were once limited to only within palace walls. This collaboration has been made possible thanks in part to our renowned musical Director, I.M. Harjito. The concert will be at Asia Society in the Upper East Side of Manhattan on Sunday, November 11, 2018 from 7:00 to 8:30 pm. Tickets can are available for sale here. In conjunction with a visit from Hamengkubuwono X, the Sultan of Yogyakarta in Indonesia, Asia Society hosts a performance by the court dancers and musicians of Yogyakarta. The Keraton of Yogyakarta brings a rare performance of two classical Javanese dance forms performed by some of the finest dancers from Java: the Wayang Topeng, a masked dance for two dancers and the exquisite sacred Bedhoyo, performed by nine female dancers who symbolically balance the universe through the patterns created with the dance. The live Javanese gamelan will feature the musicians from the Court of Yogyakarta joined by members of Gamelan Kusuma Laras. Co-presented with Yale University, Wesleyan University, and the American Indonesian Cultural and Educationoundation. This December, Gamelan Kusuma Laras is partnering with Roulette to present a concert of court music and dance from Central Java, featuring our renowned musical director I. M. Harjito, and special guests Darsono Hadiraharjo, Midiyanto, Heni Savitri, and dancer Anang Totok Dwiantoro. The concert will be at Roulette in downtown Brookyn on Saturday December 2nd at 8:00pm. Tickets and more information are available online through Roulette’s website. Save the date! 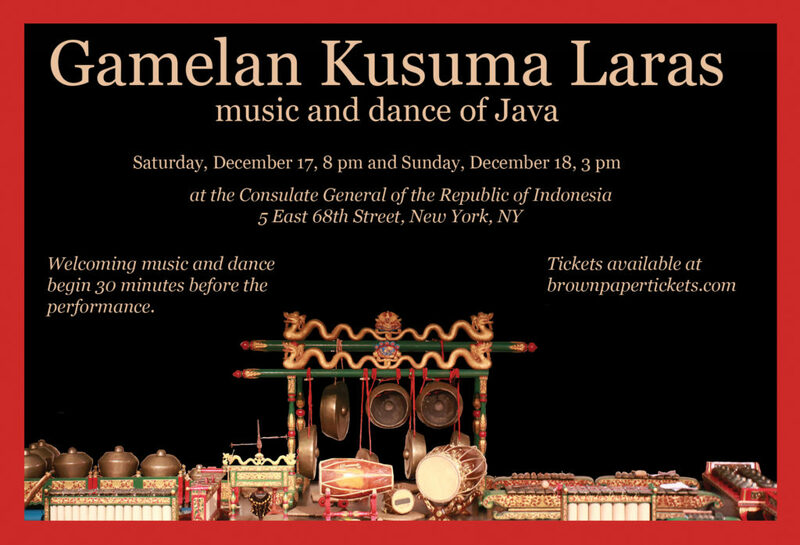 This December, Gamelan Kusuma Laras will be presenting two concerts of the court music and dance of Central Java. Tickets are $20, available in advance online at http://www.brownpapertickets.com/event/2707414. Featuring our esteemed guests Anang Totok Dwiantoro (dancer), Heni Savitri (singer) and master musician and our artistic director, I.M. Harjito. Wayang kulit, one of the world’s great dramatic art forms, is a complete theatric experience, a visual and aural artistic spectacle. Based on the stories of the ancient epic, the Mahabharata, wayang performance can be counted on to range from the highest expression of classical performance to slapstick comedy, including sly political commentary on the news of the day. 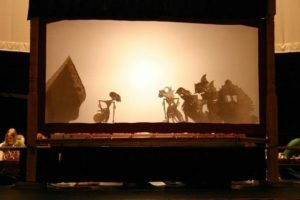 All components of the wayang, from deft and often thrilling manipulation of intricately carved and painted flat leather puppets, to cueing the gamelan musicians who accompany the play is directed by one individual, the dhalang. This artistic polymath speaks in the voices of all the puppet characters, often 25-50 in one story, recites ancient poetry, sings in the characters’ voices, provides musical direction to the musicians via sung cues or knocks using a mallet clasped between his/her toes on the wooden puppet box, and sets the pace of the unfolding story. Ki Midiyanto performs in several languages, Javanese, Kawi, an ancient Javanese poetic language, and English. On Sunday, May 15th we will host a special one-hour Javanese wayang kulit for families and children. Can’t make it to this program? Tune in Saturday, May 14, at 8 p.m.
Welcoming music begins 15 minutes before the concert. 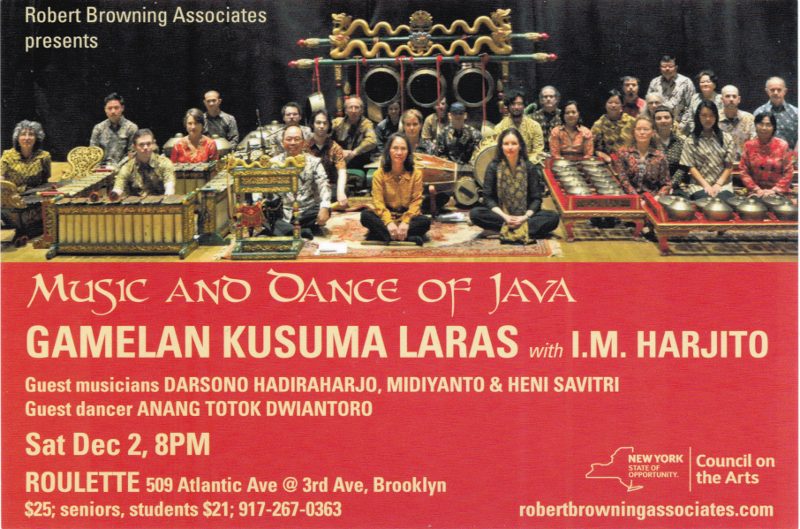 Please join us for our Spring concert, where we will be presenting a selection of pieces that illustrate the dynamic range and subtle complexity of Central Javanese gamelan music. We are honored to have accomplished dancer Anang Totok Dwiantoro join us for the dance piece, Menak Koncar, which originated in the Mangkunegaran court of Solo, Central Java, Indonesia. Don’t miss the opportunity to experience the depth and beauty of this rich artistic tradition! 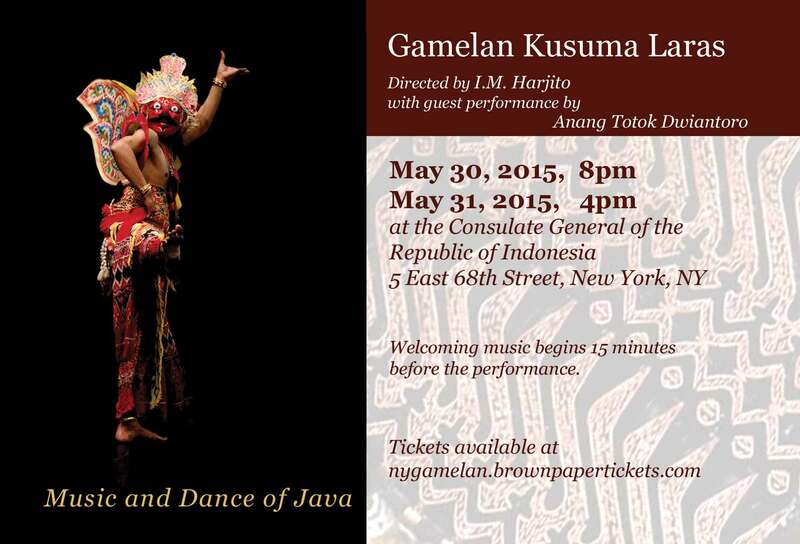 These performances are made possible by the support of the Consulate General of the Republic of Indonesia.